I recently read A Healing Touch: The Power of Prayer by Melanie Hemry. In it, she talks about when she was trying to discern what to do with her life as a young adult. She decided that she needed to listen to God and to do that she had to spend time just in his presence listening. She spend two hours a day sitting in a field every day just simply being with God until, finally, the answer came to her. Most of us don't have the leisure time in our lives to be able to spend two hours in a field, but we all can spend some quiet time simply being in God's presence. I admit, this is hard for me. I am good at saying my prayers and offering up petitions and thanksgiving to God. I read Scripture and spiritual reading and reflect on it. This feels productive to me. It is much more difficult for me to simply quiet my mind and let God know I am listening. My spiritual director has been encouraging me to do this for years. I am finally trying. Right now, I'm only doing 5 minutes a day. I hope to eventually increase. If we spend all of our time doing the talking, then we aren't taking the time to listen. I'm trying to listen. My Moment of Beauty blog has now been up for a month, featuring 31 beautiful moments. Thank you to all of you who have sent photos! If you have more that you would like to share, please send them to momentofbeauty@comcast.net. I would love to share them! I can't believe Lent is only one week away. Here are some resources that might help you have a more spiritual and fruitful Lent. One of my roles in life is as a "Child Advocate" for my parish. I am not a social worker, but in that capacity, I am responsible for making sure all employees and volunteers complete background checks and are educated on child abuse prevention. As I was filing and reviewing some materials today, I came across the following phone numbers and website to contact for help if you are feeling stressed out in your job as a parent. We all have that little voice inside our head that chatters away incessantly, offering a running commentary on our lives. What does that voice tell you? Does it criticize harshly, destroying your spirit, or does it speak words that come from God, helping you to live as God intended you to live? Is it possible to change the recording in your head? At age 15, Jennifer Rothschild became legally blind due to a disease called retinitis pigmentosa. She has not allowed her disability to define her. Instead, she got married, had children, and has become a well-known speaker and writer. Like all of us, though, she has to contend with the voice in her head, a voice that does not always speak kindly. In Chapter 4, “Speaking Truth to Your Issues,” Rothschild focuses on the woman suffering from a hemorrhage for twelve years who had the courage to reach out and touch Jesus' cloak in order to be healed. This was such a radical act. According to Jewish law, she was unclean. What she was doing was illegal. Yet, she reached out. “She told herself that if she touched Him, she would be healed. She encouraged, counseled, and advised her soul.” (Matthew 9:21) Her words of encouragement helped her faith and she was rewarded for that faith. Part 2 of the book concentrates on “Seven Things to Say to Your Soul.” Taken from scripture, these seven statements offer a jumping off point for nurturing your soul. God (and Rothschild) invite us to awaken our souls, look up to God, rest our souls, remember the good that God has done for us, persist when the road is hard, and praise the Lord. Rothschild's message that what we say to ourselves matters is a very important one. Many people tell us that we should be kind to ourselves. Self-help books are full of such affirmations. 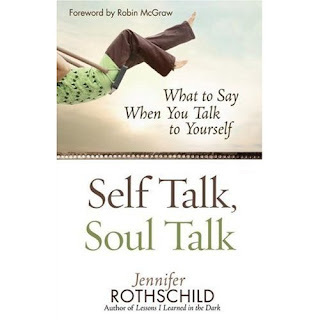 What makes Rothschild's take on this subject unique is that she utilizes Scripture to help us speak the truth to ourselves. The point of “Self Talk, Soul Talk” is not simply to help us feel better, but rather to bring us closer to God. I was catching up on some reading and came across this wonderful article by Mark Shea in the "National Catholic Register." It talks about the tough choices when a woman is pregnant with a child who suffers from serious deformities and why choosing life is still the right thing to do. Motherhood is a risk all the time. It is frightening knowing that your child could suddenly die. I know this from first-hand experience. My older son David has life-threatening allergies to peanuts and eggs. When we found out when he was a year old that a peanut could kill him, our world was turned upside down over night. Yet, over the years we have come to terms with it. We take reasonable precautions, make sure we always have an Epi-pen with him, and leave the rest in God's hands. None of us know the day or the hour when God will call us or our children home. It is our job to love them as best as we can while they are here. In 1810, Elizabeth Ann Seton began the first free Catholic school for girls in the United States in Emmitsburg, Maryland. It would become the model for the Catholic school system in our country. Elizabeth Ann Bayley was born in August 1774 into a prominent New York City Episcopal family. Her mother died when she was three and she was extremely devoted to her father, who was a doctor, and her new stepmother who provided her religious education. Unfortunately, within the first ten years of their marriage, the Setons faced a harsh decline in both William’s health and their financial situation. They declared bankruptcy and were encouraged to travel to Italy in the hope of helping William’s health. Despite her efforts, William died two days after Christmas. After his death, Elizabeth met up with the Felicchis, family friends, who took in the widow and her daughter for a time. During this period, she was introduced to the Catholic faith. Upon her return to New York, she went ahead with plans to be confirmed a Catholic, even though doing so meant that she would be financially cut off by both her own and her husband’s family. Attempting to support her family on her own, she opened a boarding school for boys, but when the parents discovered that she was Catholic, they withdrew the pupils. Elizabeth didn’t know what she was going to do. When the Archbishop of Baltimore asked her to begin a Catholic school for girls in that city, she welcomed the opportunity. In 1809, Elizabeth, her three daughters, two of her sisters-in-law, and four other young women began the American foundation of the Sisters of Charity. It was an austere life, but eventually they were able to establish a permanent convent including a school, chapel, and workroom. Beginning a Catholic School in 1810 was extremely challenging. Funds were always low. The sisters relied on the generosity of benefactors as well as the tuition from families who could pay to support their charitable efforts to educate poorer girls for free. The sisters struggled with educating students from various backgrounds with differing abilities. They had to deal with parents who questioned their methods. They did the best that they could under less than ideal circumstances. By the time Elizabeth died in 1821, the Sisters of Charity had begun five additional schools in Philadelphia and New York. This is Catholic Schools Week, a time to celebrate Catholic schools and the wonderful people who have sacrificed to make them a reality during the past two hundred years. Through it all, the religious communities and lay people who have staffed Catholic schools have done the best they could to educate countless young people and help Catholic immigrants become part of American society. Yes, Catholic schools still face many challenges, many of which are the same that Elizabeth Seton and her Sisters of Charity had at the very beginning. The other fifty-one weeks of the year can be used to discuss the problems that Catholic schools face and work on solutions. This is a week to celebrate the tradition and to say a hearty “Thank You” to all the teachers and staff, religious and lay, who have sacrificed through the years and who continue to sacrifice to work in Catholic schools. I'm convinced that at the end of this age God's heroes will be men, women, boys, and girls who no one on earth remembers. Most will be anonymous people who did nothing outstanding in their lives. Except pray. I'm pleased to announce that I have become an affiliate of "Faith and Family Flix" - an on-line movie rental service (similar to Netflix) featuring family friendly movies and television DVDs as well as faith related DVDs (which often aren't available through the local library and can be very expensive to buy). There has been such a need for a service like this. Please check them out and consider becoming a member! 10% of your membership dues will go to support the Spiritual Woman blog and website. Make Extra Money - Sign Up to Be a Faith and Family Flix Affiliate! Interested in having your wedding benefit a greater cause? The "I Do Foundation" allows couples to select charities to support. Guests can choose to give donations instead of gifts, or if you really do need the gifts (which my husband I definitely did when we got married), guests can shop with selected merchants who will then donate a portion of the total to your favorite charity. Here is a press release regarding a Catholic Writers Conference I am taking part in. It is free to attend and I will be presenting a forum on "The Art of the Blog." Meredith Gould. She will also present Self-Publishing as a First Resort. podcast). Other moderators include Tom Grace and Tim Powers. I just returned from a "Pro-Life" mass to send off a large group of teenagers and their adult chaperones who will be marching in Washington D.C. tomorrow to protest Roe v. Wade and abortion. It was a powerful liturgy with all that youthful energy and enthusiasm. I am so thankful for their witness and dedication to the cause. For those of us who can't be in Washington tomorrow, we can still spend some extra time in prayer and/or fast (it need not be a full fast, but give up something important to you and offer it up to God) for the cause to stand in solidarity with those who are marching. While they may not get much publicity, there is a dedicated group of individuals who create religious art today in an effort to create works of beauty and evangelize at the same time. Some of these artists have banned together and formed the Foundation of the Sacred Arts. Right now they are featuring a traveling exhibit called "Contemplating the Sacred: Religious Works of Contemporary Artists." To view images from the exhibit and find out more about the foundation, visit www.thesacredarts.org. “Anne, what are you going to do to me?” he whispered. “You bet!” said Davy emphatically. “No, it is in your soul,” answered Anne. Like nine-year-old Davy in the literary classic quoted above, there are times we probably wish we didn’t have a conscience. I remember being a young teenager thinking about the conditions necessary for mortal sin, one of which is that you must know what you are doing is a serious sin. It would be so much easier if nobody had bothered telling me what things were serious sins! I could do whatever I wanted with limited moral culpability. It made great sense to my thirteen-year-old brain. Unfortunately, that isn’t the way it works. We have a responsibility to inform our own consciences and to make sure that we help develop our children’s consciences. Yes, we do have to tell them what sins are. We do need to teach them the commandments. We do need to let them know right from wrong. Conscience must be informed and moral judgment enlightened. A well-formed conscience is upright and truthful. It formulates its judgments according to reason, in conformity with the true good willed by the wisdom of the Creator. The education of conscience is indispensable for human beings who are subjected to negative influences and tempted by sin to prefer their own judgment and reject authoritative teachings. . . The education of the conscience guarantees freedom and engenders peace of heart. We all have that little voice inside of us that sends out warning signals when we are on the wrong path. Our task is to listen to it. A young woman I was speaking to recently told me how she was suffering from “Catholic guilt.” Raised Catholic and still Church-going, she was sexually active with her boyfriend and they were planning on moving in together soon. They do plan to be married eventually, but she was troubled by the situation. Her conscience was screaming at her, yet she was choosing to ignore it. I encouraged her to rethink their housing plans, bringing up studies that show it doesn’t bode well for their eventual marriage. I don’t know whether it did any good, but it was one more voice to add to the one protesting inside her. Another person told me of a sum of money he had been given by accident. He asked whether he should return it. I told him that if he was asking, he already knew what he had to do. His conscience was working on him as well. When we choose to ignore our consciences, they have a way of making our lives miserable. They keep shouting at us, begging us to pay attention. A CCD teacher told the following story about teaching the sixth commandment to her sixth-grade students. She told them, “We all know what adultery is, and the truth is that it will simply bring sadness to us and to those we love.” I thought that was a wonderful description of what it means to sin. When we sin, we bring sadness to ourselves and those we love. Our lives are much better when we listen to our conscience and live according to God’s laws. My next door neighbor has been doing some work for LEGO company and they have been giving him free LEGO sets as gifts. He very generously gave the boys a couple small sets over the weekend. When he saw how excited they were by them, he returned Tuesday night with four more sets - two of which were very large. The boys were in their glory! I already put together the "Indiana Jones" set featuring 524 pieces. That one wasn't so bad - while the instructions consisted of two books, the pieces were grouped in bags by the order in which you used them and the bags were numbered. The set pictured here is supposed to build a train. Unfortunately, there were still two instruction books, but the pieces were not sorted by any recognizable system and they were not numbered. This is a painful process of trying to find the correct piece amidst the pile which is currently taking up most of my kitchen table. 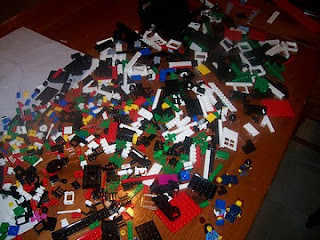 Looks like I will be spending much of this upcoming weekend bonding with LEGOs! Each weekend at mass, our parish provides children's bulletins created by Liguori Publications which contain reflections on the Gospel appropriate for children. As you may recall, this week's Gospel (Matthew 3:13-17) spoke about Jesus' baptism. John the Baptist was reluctant to baptize Jesus. He couldn't see the point. After all, Jesus should be baptizing him! It is only when Jesus insists does he agree to do it. I think at some point, we all wonder about the things we have to do and whether there is actually a reason for them. On our better days, we understand the good reasons. On days when we are tired and worn out, we start to wonder why we bother. The best reason we have is because God wants us to. As the bulletin stated "Why should I? is a question we all ask at times. God can work through people when they do what is expected of them without always knowing the why or the how of it." In 1995, Christopher and Barbara (Mikulski) Hoar wanted to adopt a child. Because they were over 40, they were encouraged to pursue an international adoption. Barbara was fluent in the Polish language and had relatives in Poland so they became determined to adopt a Polish child. The road was anything but easy. They visited Poland in 1997 and were approved for international adoption, but this was only the beginning. When they returned to America, the Hoars attempted to make contact with anyone knowledgeable in Polish adoption, including several orders of women religious. The Little Servant Sisters of the Blessed Virgin Mary, Immaculate Conception, came through with a brother and sister who were waiting to be adopted. On Mother’s Day 1998, the Hoars finally got to meet their children. They spent two weeks in Poland, getting to know the children as well as many other children who were also waiting to be adopted. While their own adoption was finalized in August 1998, they felt called to do something to help these other children left behind. Early in their own adoption process, the Hoars had met with Rev. Michael Boland, administrator of Catholic Charities of the Archdiocese of Chicago. The organization had just committed to the creation of an International Adoption Program. When the Hoars approached Fr. Boland with their desire to help these Polish children, he invited them to work with Catholic Charities of Chicago. Mrs. Elόbieta Podczazka, Director of the Public Office of Adoption and Care in Poland, came to meet with Fr. Boland. She emphasized that her office tried to place children in Poland. Only when that option was exhausted would her office look to international adoption. Even then, the first choice would be Christian families of Polish descent who would be able to help the children maintain their Polish heritage. The Hoars and Catholic Charities continued to work together to develop a Polish adoption program. Out of this experience, Christopher and Barbara began Caritas for Children, Inc. Headquartered in Milwaukee, Wisconsin, Caritas promotes, encourages, and provides support and financial assistance for the health, education, and general welfare of orphaned and disadvantaged children through the services of Catholic religious communities. Sadly, there are millions of orphaned, abandoned, and impoverished children in the world, most of whom will never be adopted. Caritas began a sponsorship program to help these children have their basic needs met and obtain an education. Caritas works with religious missionaries throughout the world to provide these services. These missionaries provide a unique service and perspective. They speak the language and are already well respected in the communities they serve. Many have first-hand experience of growing up in the same poor conditions. To find out more about Caritas and how you can help, visit http://www.caritas.us. I have been meaning to post this one for a while. When we were doing our Jesse Tree during Advent, we talked about Jesus' ancestors and how they were represented by the symbols on the tree. 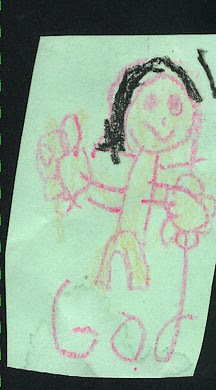 Six-and-a-half-year-old David asked, "If God is Jesus' father, shouldn't he be on the tree?" Good point, so I told him he could draw a picture of God on the tree. It wasn't until a few days later that I realized he actually had drawn a picture of God on our Jesse Tree. I just thought this was priceless and wanted to share it with you. Lord, may I believe that you give the best response to all my prayers, even when I don't understand your answers. I think that is a good prayer for all of us. As Catholics, we attend mass frequently: on Sundays and Holy Days of Obligation, and more often if we are able. The rituals are comforting and familiar. We know the prayers and when to sit and stand and kneel. With some minor local variations, we can walk into a Catholic Church anywhere in the world to attend mass and know what is going on. Yet, how much do we truly understand about the mass, the reasons why we do what we do? Have you ever wondered why certain prayers are included or why certain rituals take place? Have you struggled to understand the idea of transubstantiation (the changing of the bread and wine into the body and blood of Christ)? “Understanding the Mass” will provide the answers to your questions. Vatican II instructed that “everyone should understand well the liturgy and the ceremonies of the mass.” Fr. Charles Belmonte wrote “Understanding the Mass” to “make this understanding easier for the man on the street, for the ordinary Christian who often does not have access to more complete manuals on liturgy.” He succeeds in his task. He writes using down-to-earth language, explaining the Sacrament of the Eucharist and the Mass as Sacrifice. He also explains how to prepare for attending mass. Belmonte then goes on to describe the mass step by step from the entrance procession to the final thanksgiving. He offers historical perspective on when and why certain elements were added to the Eucharistic celebration. He explains the prayers and the rituals. This book was written in 1989 and as such contains no discussion of recent developments in liturgy such as the increased permission to celebrate the Tridentine liturgy. Never-the-less, it is an extremely useful book both for those who have been attending mass all their lives as well as those (perhaps from other faiths) who simply want to understand the Catholic liturgy better. It would also make a great text for a college class on the mass or for an adult education program in a parish setting. “The Bible says that before our children were born, God put within each of them a special plan for their lives – 'a way they should go.' The purpose our children are looking for lies within them! The Bible also says that we, as parents, have the distinct privilege of helping them find this calling and live it out. 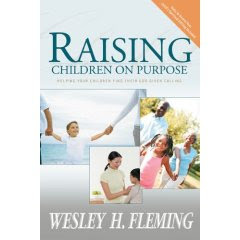 (see Proverbs 22:6)” In “Raising Children on Purpose: Helping Your Children Find Their God-Given Calling,” Wesley H. Fleming offers parents sound advice on parenting for God's purposes. God puts a lot of trust in parents. He hands us His children to take care of here on Earth. It is an awesome task and a huge responsibility. Add in all the outside influences that try to corrupt our children and the prospect can be positively daunting! Yet, as St. Augustine pointed out, “all of us have a natural appetite for God that provokes us to seek after him.” This includes our children. Our children want to know and love God. The child who knows and loves God will do God's will. It is our task to model and show them the way. Children learn about God from their relationship with us. As Fleming states, “We are the first Bible our children will read.” If a child learns that he can trust his parents, he will learn that he can trust in God. If a child feels safe with her parents, she will feel safe with God. By meeting our children's emotional needs (at least the majority of the time), we set the groundwork for their relationship with God. Fleming lists a child's seven emotional needs by using the acrostic PARENTS: Protection, Acceptance, Recognition, Enforced Limits, Nearness, Time, and Support. He then goes into detail about how to meet each of these needs. His parenting advice is very balanced – neither too restricting for children, nor too overprotective. His parenting style could be described as being very respectful of both parent and child. He recommends giving children choices but also maintaining limits. He advocates spending as much time as you can with your children and engaging in regular physical affection. He knows that as parents we sometimes fail in our roles and acknowledges that there is no such thing as the perfect family. While we can always work for improvement, we also need to accept our own failings and ask for forgiveness, both from God and our children. Fleming also emphasizes the importance of prayer in our parenting. We can't do it alone. God is there to help us and guide us and give us strength in this most important undertaking. Fleming also suggests praying for our child's future spouse that he or she may be brought up well also. A very helpful part of the book are the appendices. There is a handy guide for helping to find your child's God-given calling (if you are still searching for your own, it could help with that as well). There are sections on discipline and setting rules. There is also a section on breaking the cycle if your own family of origin was dysfunctional. “Raising Children on Purpose” is an excellent book. Parents will find so much good information in it. Many parenting books offer general guidelines. This book is very specific. You will find tools that you can use in your own parenting and that will help you raise your children to fulfill the roles for which God created them. Are you interested in learning more about modern Catholic music? Visit www.topcatholicsongs.com for songlists, downloads, and more. I have been reading "Raising Children on Purpose" by Wesley H. Fleming (a very good book which I should be reviewing soon). In it, he writes "Research shows it takes ten compliments to balance the negative emotional impact of one criticism . . . You can't overdo it if affirmation is sincere." I think that is true. As someone who has been involved in creative ventures for most of her life (as an art major in college, as a graphic designer, and now as a writer), I have been subject to a considerable amount of criticism. While I like to think I have built up a thicker skin over the years, the truth is that it always hurts, and it stays with you a lot longer than the compliments. There are different kinds of criticism - the constructive kind which offers concrete advice on how one might improve. This is a necessary kind - still painful, but at least useful. Then there is the personal criticism, when someone, just to be mean, tells you that they think you stink and have no value. This kind has no redeeming value and hurts horribly. Sometimes, in parenting, we do need to offer constructive criticism, but it should be balanced with liberal amounts with praise for things done well. The second kind has no place in parenting, and I would venture to say, in personal relationships in general. It is painful and cruel and certainly against Jesus' commandment to love our neighbor. Next time you are getting ready to criticize someone (child, spouse, co-worker, total stranger) - think about why you are criticizing and the purpose of it. Choose your words carefully and act out of love, not out of anger or spite. Our words have tremendous power to both tear people down and build them up. After the arctic cold we experienced last week, we have been getting a hint of spring the past couple of days. Right now my front door is open and I am sitting by it just breathing in the fresh air. It feels wonderful! I know winter will be returning soon, but it is just so nice to have this small break with the promise it holds for spring ahead. Thank you, God, for a beautiful day! I have begun participating in the Catholic Exchange Women’s Bible Study being presented by Cheryl Dickow. (There is still time to join! – visit http://bezalelbooks.com/women's%20bible%20study.htm by January 12th). The question for the first week is “What is a Woman’s Worth?” I know this is a question I have struggled with for years. Dickow states that “Scripture assures every woman who has ever lived that her life is both special and valuable. Her life has a purpose and a meaning set by God and necessary to His plan for humankind.” She emphasizes that we need to study Scripture and look to God and His Word to discover our purpose and our true worth. I agree whole-heartedly. Yet, in living in this very imperfect world, it does not always seem so simple. God’s purpose for my life has not always been very clear. Like many other women, I have prayed and cried and searched for direction. I have begged for a sign. I have tried to follow God’s lead and yet have met with resistance and obstacles. Were these signs that I was on the wrong road or signs that I needed to persevere? Sometimes God’s will seems shrouded in mystery, or as Heidi Hess Saxton once wrote, sometimes God is simply telling us to exercise our free will and choose. God will work with whichever path we pick. Yes, it can all be very confusing. The question of worth is at the core of who we are and how we define ourselves. Raised as a modern woman, having been to a women’s college, and having a job I loved, I tended to define myself in terms of my ability and my place in the world. Yes, I was also a wife and a daughter and a sister but if someone posed the question, “Who are you?” that wouldn’t have been the start of my answer. All that changed after I had my first child. My main function in life was no longer my career; it was my role as a mother. It was a change in identity that I was not prepared for. I knew what I was doing mattered. I wanted to raise my child to the best of my abilities and I knew that I wouldn’t get a second chance at that and that my career had to come a very distant second. I knew I was doing the right thing for my family, and yet my sense of worth was very seriously diminished. I know now that it shouldn’t have been. In the intervening six years, I have come to appreciate motherhood so much and what it has brought to my life. I would not trade my time with my children for anything. Yet, there are still days I base my worth on the world’s standards instead of God’s. There are days I feel like a total failure. I look at other women who seem to be both wonderful mothers and very successful in their professional lives. I wonder why that can’t be me? I wonder why God’s plan seems to have taken me down the particular path I am on. I wonder why I still dream of doing things that I simply can’t do while continuing to provide my children the care and time that they need. I wonder what my future holds. Yes, I am an imperfect person living in an imperfect world, trying to rely on God and make sense of it all as I go along. My worth, as does the worth of every human being, comes from God, not from any thing or any person on this earth. Sometimes, I forget. I am thankful to the Women’s Bible Study for providing a much-needed reminder and I look forward to the rest of the program for the other lessons it may hold. Pamela Hines has been married to her husband Darrell for over twenty-five years. Together they pastor a thriving Christian Faith Fellowship Church in Milwaukee. Their marriage has not always been problem-free, however, and she understands the struggles of married couples. She echoes the words of her mother-in-law that “marriages are under attack.” This is so true. Our marriages need our prayers more than ever. The prayers cover all aspects of a man’s life, from his desires to his strength to his physical well-being. There are prayers for his career and his life in Christ and his relationship with his family. There are special prayers taken from the Proverbs, the Letters of Paul, and Psalm 119. As I was reading these prayers, I felt that they were universal. They could be used for anyone someone wanted to pray for. Our husbands need our love and our support, and most importantly, they need our prayers. Pamela Hines has done us a great service in offering these Bible-based prayers. but we shall be in the future has not yet been revealed. I've always had a fondness for this Gospel passage because it was read at my first communion. All these years later and I still remember! It is a passage with such implications. We are children of God! What more could we possibly ask for? At the same time, it holds such promise for the future - a future that we can only imagine, and yet our imaginings can not even begin to fathom the glory that awaits us. You are Invited to a "Moment of Beauty"
Over the past few months, I've been trying to come up with some new business venture. I had some requirements, however. It had to be something I could do from home, have low investment and overhead, and be something that would help improve people's lives and the world in some small way. I had a couple of good ideas that proved to be unfeasible for various reasons. So, as 2007 winded down, I felt a little discouraged and was still searching for that new idea that would work. But then, an idea came to me on December 31st. I would like to say that I had this brilliant flash that came out of nowhere, but, no, it came as I was reading a "Junie B. Jones" book to the boys. "Junie B. Jones" is not classic literature by any stretch of the imagination, but the kids think she is great. In this particular book, "Aloha-ha-ha", Junie and her parents are going to Hawaii and her 1st grade teacher instructs her to keep a photo-journal while she is gone - at least one picture for every day. I began to think "What about posting a photo for each day?" - a moment of beauty that might otherwise go unnoticed. We are all so busy; we tend to just pass by all the beauty that surrounds us. So, I have begun a new blog which will post at least one photo a day that invites us to just take a moment to appreciate something beautiful: MomentofBeauty.blogspot.com and I am inviting all of you to take part. Please send photos of your favorite "moments of beauty" to me at momentofbeauty@comcast.net. The only rule is that you must have taken the photo (I don't want any copyright infringement issues.) I will be happy to list your name and to post a link to your website or blog. As an added plus, I plan to donate one half of the revenue earned from advertising and Amazon sales each month from this blog and that blog to charity. For this month, I have chosen "Habitat for Humanity." Please help me spread the word about this new venture. Please tell your friends (some of you will be receiving an email from me that you can then forward). 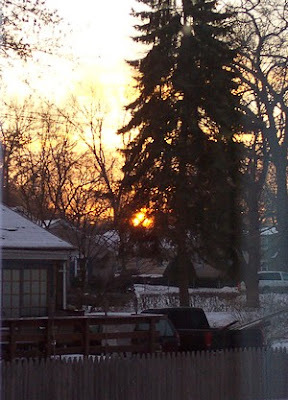 Please send your photos and bookmark the page so you can visit often and take in a "moment of beauty."